I spent a few months back in 2013 playing through the entire God of War series of video games and had quite a fun time with them. None of the games completely blew me away but they were exciting and bloody even if Kratos was a pretty despicable main lead. It was nice to hear a new game in the series was coming, and an unexpected surprise that instead of Greek mythology the setting would leap to Norse mythology instead. 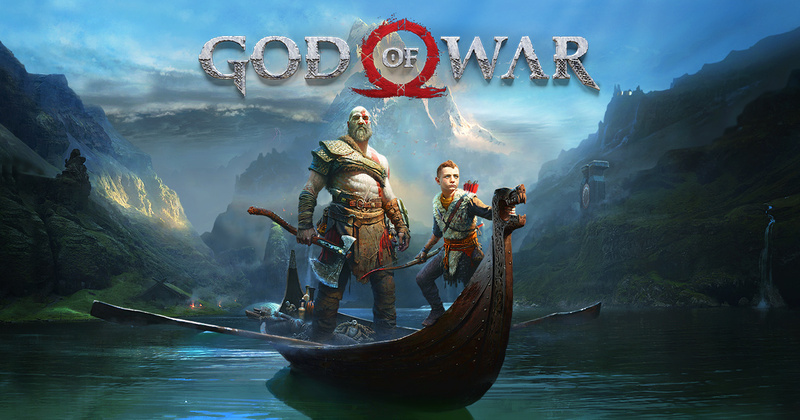 Not only that but this soft reboot for the series would have an older, more repentant Kratos (voiced by Christopher Judge) who not only has had to live with the consequences of his past rash actions, but now has a son; Atreus (Sunny Suljic) who he wants to ensure doesn't go down the same dark path he did. 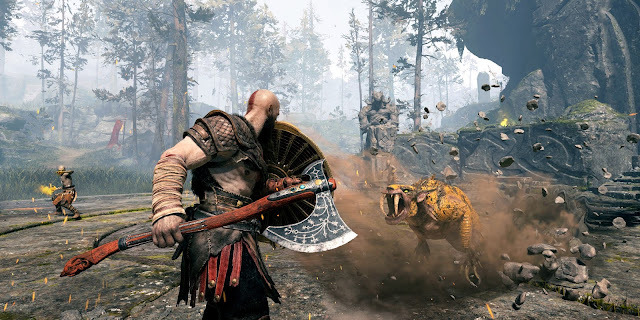 The game begins some time after the events of God of War III with Kratos living a mortal life in the wilderness with his son, and his wife having recently died. Her dying wish was that her ashes be scattered from the highest mountain in all the lands. One day a stranger arrives at the home, this stranger turns out to be Baldur; a God who is after Kratos for unknown reasons. With his peaceful existence shattered Kratos decides to set out on his quest with his young son to carry out his wife's wishes. The previous games in the series had been around five to ten hours long each and so I picked this up expecting a little adventure to play in between doing Mass Effect: Andromeda. It wasn't long after starting this that I heard this was actually a much larger game, I reckon it must have taken me between 40 to 60 hours to complete, and that is without 100% all the side quests and getting all the collectibles. God of War was a linear fighting adventure game before, here this is a semi open world adventure RPG. You gain abilities and armour that level up your character, while enemies themselves have different levels to them meaning you have to get stronger to do some areas. This is a long game, but that includes the side quests which are entirely optional but see you going to huge new areas. The main plot itself was expertly voiced and had some really epic moments, but it was the downtime between Kratos and his son that led to the biggest emotional aspects. The main hub area is the Lake of Nine which you travel around in a boat, here there are countless conversations that the duo (and later a talking head) have that not only gives history to the world (that takes place pre Vikings when the Norse myths were still occurring) but really creates a believable bond between father and son. I expected Odin to be the big bad here but this is more low key with antagonists you fight being lower down on the chain. Baldur is the main antagonist, with Thor's sons Modi and Magni (voiced by Nolan North and Troy Baker) being his henchmen. This makes sense with the main quest being such a low key personal adventure and it is certainly hinted that a sequel will include bigger adversaries such as Thor. Helping you out are a number of allies which along with the talking head; Mimir who gives history to the location, include a friendly witch; Freya, and two dwarf brothers who act as the shopkeepers for the game. These can both sell you new armour and weapon attachments, but also can upgrade your equipment. God of War is known for the fantastic chain whips Kratos wields, going with the new style his main weapon here is actually a magical ice axe. This axe can be thrown at enemies and has plenty of attacks to make it feel as deep and involved as the chains but I did miss those other weapons a bit. Without going into much there are some late game developments that could possibly make fans of the other games feel more at home. Atreus is far more than just a tagalong A.I, much like Ellie in The Last of Us he is an essential part of the game. Armed with a bow that later gets magical properties he helps tremendously with stunning enemies, his arrow firing assigned to the square button. Being Norse mythology the enemies are based around the monsters of those tales. You have wulver which are werewolf type creatures, as well as wolves, ogres, and the cannon fodder which are the draugr (zombie like enemies that take on a lot of different elemental types). These can all be killed with the traditional brutal finishers. There are a lot of bosses as well which are epic to fight each and every time. As well as the minor Gods you fight you also face off against dragons, dark elves and more. 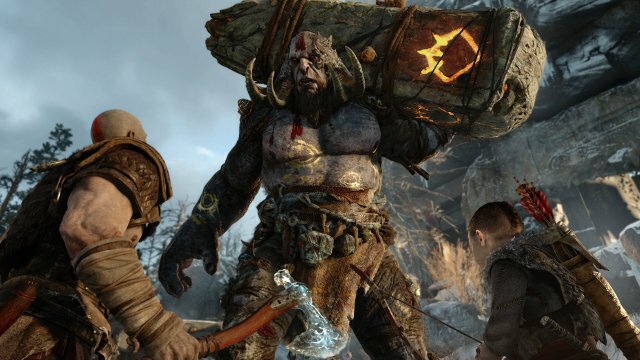 There are nine different realms in Norse mythology, in God of War you can travel to six of these, each area looking vastly different to the others and having their own distinct flavours to them. Helheim for instance is the Norse version of Hell and reminded me a bit of the disappointing Dante's Inferno, Alfheim is the home of the elves and had a more Lord of the Rings vibe to it. Most interesting are the two optional areas. Muspelheim is the land of fire and consists of a series of challenges such as defeating 100 enemies in a row, or defeating a set number of enemies without taking damage. Doing these challenges give you materials to create stronger armour, and I liked how the challenges while very gamey are fitted into the games lore. Even better was Niflheim that takes place in a realm of poisonous fog. This part consists of a randomised maze with Kratos constantly getting poisoned and so gives you a time limit to explore it, this had a bit of a Dark Souls style feel to it in that the material you gain here must be returned to the starting area to bank it, otherwise should you perish it is all lost. There are also a series of optional boss battles to find, each one against a valkyrie, these were great battles. All areas, in fact everything here looks stunning, these are some of the best graphics I have seen on the PS4, everything down to the particle effects themselves are so attractive, coupled with a great soundtrack, voice acting and gameplay this is pretty sublime. 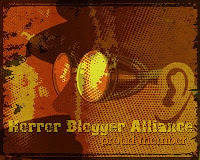 The story was interesting though I did feel it wasn't as mind blowing as it often seemed to think it was being. 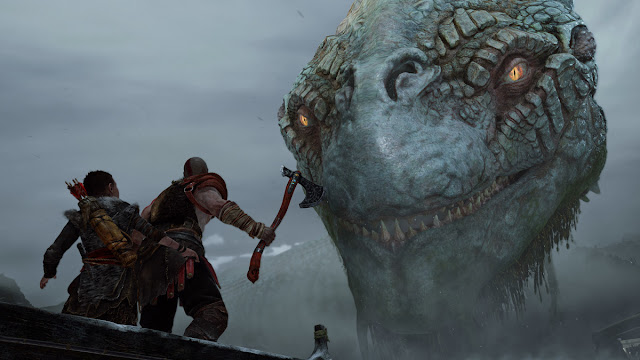 There are call backs to the plot of the other God of War games but it is never mentioned in any sort of detail, I wish there had been slightly more reference, such as a cutscene or something. While the open world nature is cool it did lead to no really big areas or dungeons. There are dungeons but they are at best moderate in size with nothing to rival say Pandora's Temple from God of War which remains to this day one of the best designed dungeons I have ever seen in a video game. There are still puzzles to solve though with a Metoridvania lite style of new abilities (such as being able to create bridges of light, and freeze switches) meaning older areas have new secrets to reveal upon revisiting them. Everyone seems to love the new God of War, I am one of those people. This is a giant game stuffed to the brim with things to do, featuring a great cast of characters, stunning locations, and wonderful gameplay. If you own a Playstation 4 this is one of the essential exclusives you must play.